Ben Margot/AP Joe Torre walks to the mound to replace Hong-Chih Kuo with Jonathan Broxton in the bottom of the eighth inning today. Why am I unhappy about today’s deadline deals? After all, to reiterate a point I made this afternoon, the Dodgers now have a pitching staff that you can quite reasonably hope will shut down the opposition on a daily basis. The Dodgers have five starting pitchers with ERAs below 4.00, and that’s not without significance. There’s a formula in place for winning if the team can start hitting at all — something they might do, if these guys can get their act together and Manny Ramirez has one last spurt left. Just when you think you know what will happen, you’re caught off guard. Anyone from Clayton Kershaw to Ted Lilly can have a bad game, and pitchers can fall into ruts like the one Jonathan Broxton, who allowed a crushing, game-losing home run to the Giants today after falling behind in the count 3-0, currently finds himself in. Today was a day Broxton gave more ammunition to his critics. Today was also a day Chad Billingsley left his naysayers mute. (I’m assuming there’s some intersection between those two groups.) Stepping up to pitch on three days’ rest, Billingsley extended his scoreless inning string to 21 2/3 innings. Heck, he even hit two batters — so there. 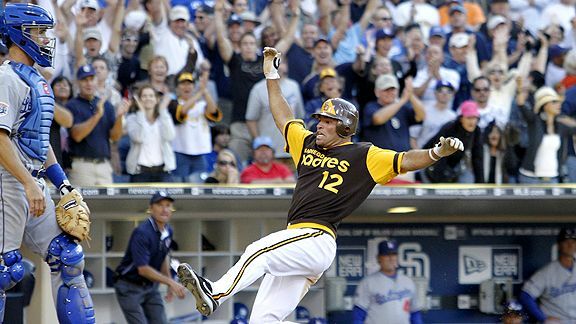 And he would have gone even further in the game if not for a seventh-inning error by Rafael Furcal that, though it did not lead to a run, accelerated Billingsley’s exit and might have been the first domino of today’s loss. In any case, the acquisition of Lilly helps the rotation, and the addition of Octavio Dotel, if nothing else, gives Joe Torre an arm he’ll trust at the outset, which might spare us the destruction of other, more valuable arms. The problem is that within 48 hours, the Dodgers traded Blake DeWitt, James McDonald, Lucas May, Elisaul Pimentel, Brett Wallach, Kyle Smit and Andrew Lambo for two months of Lilly, Dotel and Scott Podsednik and potentially a couple of more years of (grumble) Ryan Theriot. Two months of one decent starting pitcher and three marginal contributors. It is impossible for me to believe those seven players, assembled together, would not have been enough to bring Cliff Lee to Los Angeles. It is impossible for me to believe these assets could not have been better used in some fashion. And so whether Lee would have been the difference-maker for the Dodgers, whether or not the seven players traded away were going to be of much value going forward, it is impossible for me to feel good about what has happened. Maybe Lilly, Dotel, Podsednik and Theriot go hog-wild and carry the Dodgers to a title. I have no way of saying that won’t happen. But I’m not happy the Dodgers gambled what they gambled to make the bet that they made. The Dodgers don’t look particularly good entering the 2010-11 offseason. Three-fifths of the current starting rotation will be free agents, as will their left fielder, and the team will face serious offensive problems at no fewer than three other positions. This week brought an opportunity to begin addressing those problems, or make a bold move toward winning in the last year before those problems manifest. Instead, the Dodgers added, and subtracted and got a little better, but not a lot. Look, the Dodger are in a serious funk, and I’m not immune. If the team weren’t on this latest four-game losing streak, we’d all feel better about things. So keep that in mind when I say that this week’s trades feel more symbolic of the Dodgers’ weaknesses, in ownership, front office and clubhouse, than like solutions to them. They are trades that seem destined to keep us wandering rather than reaching Shangri-La. Octavio Dotel, 36 years old with 52 baserunners allowed in 40 innings for Pittsburgh this season against 48 strikeouts, comes to Los Angeles as the Dodgers give up on James McDonald and minor-league outfielder Andrew Lambo. Dotel has had a brief resurgence since mid-June, so the Dodgers will try to ride that wave and hope this isn’t another Edwin Jackson for Danys Baez. In a way, the Dodgers are copying the Padres’ formula — trying to smother the opposition with pitching options, and hope the offense scores just enough to make it worthwhile. It’s a plan that could work, especially if Manny Ramirez comes back and Matt Kemp and Andre Ethier step things up. I’m just not in love with the guys they acquired this week to try to make it happen. In other news, Andre Ethier is away from the team for the birth of his second child. The Dodgers traded Blake DeWitt and decent prospects Brett Wallach and Kyle Smit today for Ted Lilly, an inconsistent, 34-year-old pitcher in decline, and Ryan Theriot, a 30-year-old infielder who is more expensive and worse than DeWitt. Undoubtedly, Lilly will provide some short-term gain in the rotation, but the Dodgers have actually made themselves worse in the lineup, and are paying for the privilege. Daring escape their midnight dreary, the Dodgers scored as many runs in the ninth inning tonight than they had scored in any of their past eight games. 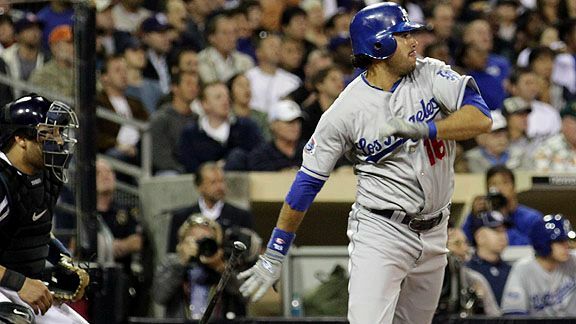 Rafael Furcal broke out of his recent slump with a single, double, solo homer and two walks. But still, the Dodgers lost, in maddening fashion. A three-run rally in the ninth inning fell one run short, and Los Angeles fell 4 1/2 games back in the National League wild-card race with a 6-5 defeat. After being held to two runs yet again over the first eight innings tonight, the Dodgers’ comeback felt as much like their luck turning as anything else. Jamey Carroll’s force-out grounder avoided being a double play by a hair. Scott Podsednik’s long fly ball was run down by center fielder Andres Torres but clipped off his glove for a triple. But on the other hand, Furcal had a legit perfect night at the plate (though not so perfect on the basepaths, as he was thrown out trying to stretch a double into a triple earlier in the night). And after James Loney was hit by a pitch (Giants pitchers hit three more Dodger batters tonight), Matt Kemp worked his way from a 1-2 count to go with a 3-2 slider, like the grownup everyone wants him to be, and single to center field, driving in Furcal and putting Loney on third as the tying run with two out, tapping at our chamber door. Just as your eyes started to widen with hope, Casey Blake grounded into a force play at short. Darkness here, and nothing more. Giants ace Tim Lincecum once again looked surprisingly beatable, allowing eight baserunners in the first three innings, but the Dodgers let him off the hook in the top of the third, failing to score after Furcal’s leadoff homer despite a single, a double and a hit batter. (Andre Ethier was easily thrown out at home on a fielder’s choice.) Carlos Monasterios mostly kept San Francisco at bay tonight, leaving in the sixth inning with the Dodgers trailing, 3-2, but you picked a fine time to leave me, Jeff Weaver. For the second Friday in a row, Weaver came in with the Dodgers down a run and let things get out of hand, allowing an inherited run and two others to score. The deficit turned out to be not quite as insurmountable as we thought, but it was insurmountable enough. The Dodgers fell to 5-10 since the All-Star Break. These things pass, they do pass, but then again, so do kidney stones. It’s a painful, painful process. One of the last things the Dodgers have been able to cling to, their dominance of the National League West, has been chipped away with three consecutive defeats. Essentially, they have to start over. Any more beanball warnings tonight? Dodgers at Giants, 7:15 p.m. Eight consecutive games without scoring more than two runs in nine innings, and now Tim Lincecum. Well, the Dodgers hit him last time out … before the roof caved in. Hypothetical: Would you rather the Dodgers spend $4 million on the remaining 2010 salary of Cubs pitcher Ted Lilly after acquiring him in a trade, or the team’s top 2010 draft choice, pitcher Zach Lee? Dennis Poroy/AP Scott Hairston slides home with the winning run for San Diego. Not trying to shirk my duties, but for the second game in a row, there’s really nothing for me to tell you that you don’t know already know. You know that the Dodgers’ 3-2 loss in the bottom of the ninth at San Diego was a winnable game. But no. It’s as if the Dodgers are trying to play me out of a job. Dodgers at Padres, 3:35 p.m.
With Matt Kemp being rested, Scott Podsednik is making his first CF start of 2010 today in his Dodger debut. He will be the 40th player to suit up for the Dodgers this season. The Dodgers designated Jack Taschner for assignment to make room for Posednik. Taschner faced six batters as a Dodger and allowed a hit and three walks. Joe Torre also told reporters today that Chad Billingsley, who threw under 90 pitches in his six-inning shutout effort Tuesday, will start Saturday in San Francisco on three days’ rest. At this time, John Ely will not be recalled from Albuquerque. Roy Oswalt is headed to Philadelphia. Considering that the Astros will pay nearly half of the $23 million owed Oswalt through the 2011 season, it’s natural to ask whether the Dodgers should have gotten him after all. Philadelphia gave up one major-leaguer, 27-year-old J.A. Happ, who had a 2.93 ERA in 2009 but has pitched only 15 1/3 major-league innings this year, along with two minor leaguers: outfielder Anthony Gose (whose numbers aren’t impressive unless you keep in mind he’s a 19-year-old in A ball) and shortstop Jonathan Villar (same story). I’m inclined to think that if John Ely had kept his early season performance going, or if James McDonald or Scott Elbert’s 2010s hadn’t largely washed out, the Dodgers could have done this deal. But none of those players were enticing enough, and so the only alternative major-league pitcher for the Dodgers would have been to trade Chad Billingsley (Clayton Kershaw is the staff leader for years to come, while free agents-to-be Hiroki Kuroda and Vicente Padilla would not have interested Houston). Trading Billingsley for Oswalt could improve the Dodger starting pitching, though at great cost and without helping fill out the fifth spot in the rotation. The other way to have gone would have been to send more in the way of prospects. You don’t need me to point out the pros and cons of that. In short, if in fact he would have approved a trade to Los Angeles, it turns out that Oswalt wasn’t out of the realm of possibility for the Dodgers, despite all their handicaps — ownership, talent base, setbacks in player development, etc. At the same time, the fact that he isn’t here underscores how relevant those handicaps are. 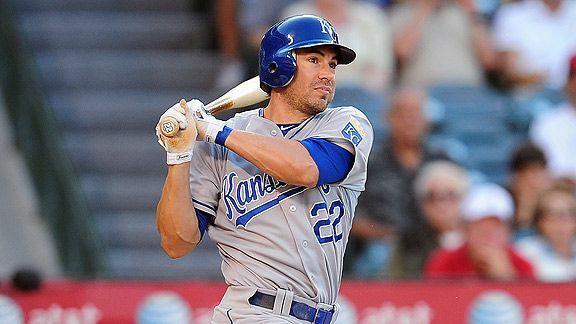 Newly acquired Scott Podsednik has a .353 on-base percentage and .400 slugging percentage. Newly marginalized Xavier Paul has a .298 on-base percentage and .339 slugging percentage. If Paul had reached base seven more times in his 124 plate appearances this season and had seven more total bases in his 112 at-bats, he’d have surpassed Podsednik’s batting stats, going .355/.402. Seven more singles in those 112 at-bats would have accomplished both tasks. This is a simplistic way to look at things, but I just find it interesting that the difference between the two is so slim. But for seven singles, Podsednik would offer no advantage in the batter’s box, and despite whatever other attributes he offers, I’m guessing the Dodgers don’t trade for him. It would be nice if the Dodgers scored a bit more. The Dodgers parted with AAA catcher Lucas May, and more significant, Class A pitcher Elisaul Pimentel. Podsednik, a 34-year-old left-handed hitter, draws comparisons to Juan Pierre — not the least because the White Sox replaced Podsednik with Pierre this winter. Podsednik hits for a bit more power than Pierre — as well as current Dodger part-time left fielder Jamey Carroll — but of course that’s not saying much. Podsednik’s slugging percentage in 2010 is .400, to go with a .352 on-base percentage. Like Pierre, Podsednik likes to run — but gets caught stealing his fair share. In other words, this guy helps your team, but not a ton. Pimentel, who turned 22 this month, has had a very nice 2010 season for Great Lakes: 3.49 ERA with 97 strikeouts in 90 1/3 innings, against 106 baserunners. Those numbers were actually even better until a poor July. May, 25, has an .848 OPS for Albuquerque — he probably isn’t a serious catching prospect at this stage. He wasn’t going to replace Russell Martin or anything next season. This is a hard spot for me — I never like to give up promising young pitching unless it’s for a major player, and I don’t think Podsednik qualifies. My first reaction is that it’s not the worst trade the Dodgers could make, but I’m not sure it was necessary. The only thing I’ll say is that, given that Pimentel was probably going to be at least 24 before sniffing the big leagues, I’m guessing the Dodgers didn’t surrender the next Pedro Martinez. Hulton Archive/Getty Images Farewell, Billy Loes. 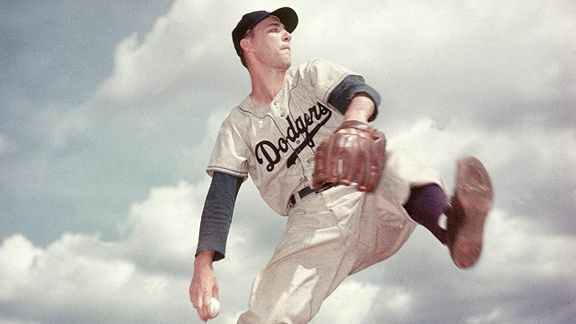 The unforgettable man in Dodger lore pitched had a 3.59 ERA in 1955. Dodgers at Padres, 7:05 p.m.
Yesterday’s late scratch of Claudio Vargas due to lower back soreness created an instant ripple effect throughout the Isotopes rotation. Today’s originally scheduled starter Jesus Castillo was forced to pitch yesterday, creating a void that was to be filled by Bobby Blevins. The righthander’s flight through Atlanta from Double-A Chattanooga was canceled, however, putting Blevins’s arrival before gametime in doubt. Enter lefty Cody White, who was summoned from Phoenix where he had been pitching for the Arizona League Dodgers. In his previous stint at Triple-A, White went 3-0 with a 7.59 ERA (18 ER / 21.1 IP) in six appearances, two starts. While reliever Jon Link will get the start (today), White is likely to see action quickly as the reliever’s longest outing this year is two innings. Ramon Troncoso, by the way, gave up a grand slam in his one inning of work Tuesday for the Isotopes. Hiroki Kuroda is the subject of a nice profile by Andy Kamenetzky of ESPNLosAngeles.com. Gregory Bull/AP Andre Ethier breaks a scoreless tie in the seventh inning with a two-run, pinch-hit single. Too sick to start Tuesday’s game in San Diego, Andre Ethier made the Padres feel ill in their showdown with the Dodgers. Ethier, a late scratch from the starting lineup with the flu, came off the bench in the seventh inning to deliver a two-run single – all the medicine the Dodgers needed to come away with a 2-0 victory. Chad Billingsley and Jon Garland each pitched shutout ball through six innings, though both starting pitchers had one inning of major tightrope-walking in that time. In the bottom of the fourth, three singles loaded the bases before Billingsley retired the next three batters on a groundout, popout and strikeout. In the top of the sixth, with runners on first and second, Garland nabbed Rafael Furcal, Xavier Paul and Matt Kemp on 3-2 pitches. It was an echo of Friday’s game, when Torre pinch-hit for Vicente Padilla despite a low pitch count. But this time, with Garland left in to pitch despite lefty Joe Thatcher warming in the bullpen, Ethier grounded a 1-1 pitch hard, just past a diving Everth Cabrera, driving home the first two runs of the game. That put the game in the hands of the Dodger bullpen, starting with Hong-Chih Kuo. Despite being interrupted by a single and a Casey Blake error, Kuo struck out the side. After throwing 20 pitches that inning, Kuo came out in the eighth to face Padres slugger Adrian Gonzalez and struck him out on three pitches. He faced Chase Headley, and struck him out on three pitches. He threw two more strikes to Yorvit Torrealba before finally missing, and then gave up a single. 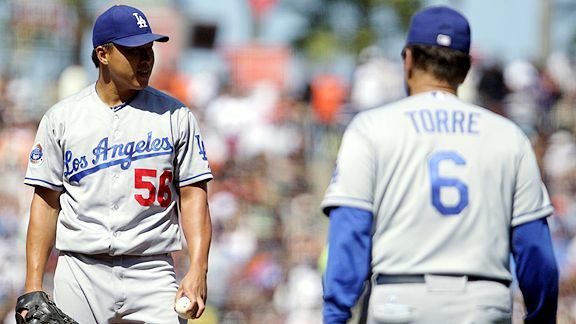 On his season-high 34th pitch, Kuo got Will Venable to ground out, taking the game to the ninth. In the bottom of the ninth, Jonathan Broxton breezed through the first two hitters on three pitches. That brought up his nemesis, Matt Stairs, with a .597 OPS this season. Broxton missed with his first three pitches, but came back to strike Stairs out and bounce off the mound with the save. First step. The Dodgers were held to two runs or less for the eight time in 12 games since the All-Star break, but they closed their gap in the National League West to five games. Los Angeles remained 2 1/2 games behind San Francisco for the NL wild card. Andre Ethier a late scratch due to illness. The Dodgers can’t quit Juan Castro. The team once again signed him to a minor-league contract, setting him up for a critical sacrifice bunt in September. Castro had a .237 on-base percentage and .238 slugging percentage with Philadelphia this season — including one sacrifice. That August 6 Clayton Kershaw-Steven Strasburg showdown may have fallen by the wayside with the news that Strasburg was scratched tonight from what would have been his 10th major-league start. Kershaw told David Lassen of the Press-Enterprise that he decided to drop the appeal of his suspension because of the scheduling of the hearing Thursday. “In the event that I did lose the appeal,” he said, “… I’d have four days rest, and then the appeal would come, and then I’d have five more games.” That would mean he wouldn’t be able to pitch again before August 4, truly missing a turn rather than just having a start pushed back a day. Joe Torre confirmed to reporters today that Carlos Monasterios will start Friday. Torre hasn’t officially named a Saturday starter. Torre also said that the Dodgers have underachieved, but that he isn’t worried, and that he senses Ned Colletti will make a move. Rookie-advanced Ogden clinched a playoff berth last night by winning the first-half Southern Division title and improved to 22-13 with an 11-2 win over the Missoula. Jake Lemmerman, the club’s fifth-round selection in the 2010 draft, leads the Pioneer League with a .380 batting average and the Dodgers’ third-round selection Leon Landry ranks third with a .372 average. On Sunday, right-handed pitchers Daniel Tamares (5-2, 1.69) and Abdiel Velasquez (2.66) combined to throw a no-hitter in the Rookie-level Dominican Summer League Dodgers’ 3-0 win over the Mets. Tamares, who was named to the league’s All-Star team, struck out six over his 6.0 innings and has not allowed a run over his last 20.0 innings. Single-A Great Lakes outfielder Brian Cavazos-Galvez homered twice last night to extend his Loons franchise-record hitting streak to 24 games. By and large, the Dodgers’ three-game series that begins tonight San Diego has been painted in the media as a must-win affair. It’d certainly be nice for the team if they won the series, but it’s not a make-or-break event. Say the Dodgers win only one of the three games. That would leave them seven games out of first place in the division (fewer behind in the wild card) with nine weeks to go. Last year, the Dodgers nearly blew a six-game lead in the National League West with nine games to go. Four years ago this week, the Dodgers were swept by San Diego to fall into last place in the NL West, 7 1/2 games out of first, and they still made the playoffs. Obviously, the Dodgers don’t want to wait until the last minute to make a move — comebacks are anything but automatic. But the idea that it’s now-or-never time is just silly. 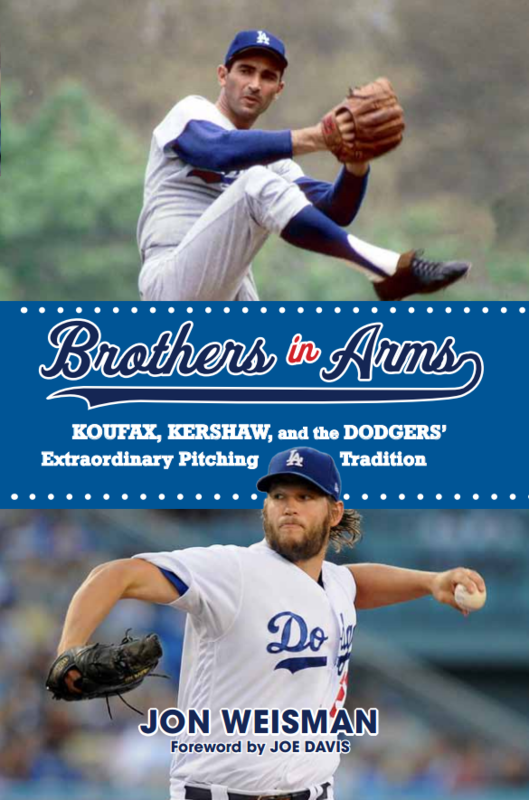 The rejiggering of Clayton Kershaw’s pitching schedule following his suspension set up a likely showdown between him and fellow 22-year-old phenom Steven Strasburg of Washington on August 6 at Dodger Stadium. The duffel bag that Jackie Robinson carried on a bat over his shoulder in his famous Dodger farewell photo appears to be up for auction, writes Ernest Reyes of Blue Heaven. I don’t think Matt Kemp has done anything this year that bugged me more than his extra-effort tackle of James Loney on Saturday, and this is why. This isn’t about me being a sourpuss: There was plenty of celebration underway before Kemp almost took Loney out. Mike Piazza was the subject of a long interview at Athletics Nation. Back in Spring Training, Dodger video cameras caught Kenley Jansen chatting it up with DeJon Watson, Logan White, Rodney McCray, Joe Torre and Sandy Koufax.